Bolanle Olukani was involved in a horrific accident recently but managed to escape unscathed afterwards. 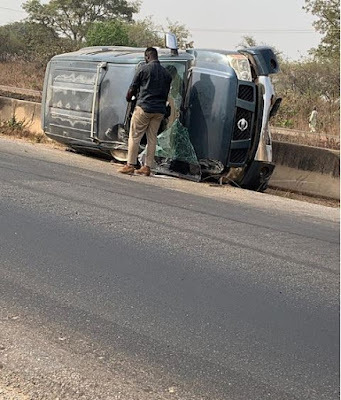 The media personality took to her Instagram page to share with her fans how the accident happened and she was filled with appreciation to God for life. According to her, the accident happened about two weeks ago. She was in the car with six other persons and no fatality was recorded. Giving her testimony, she wrote: "Upper Sunday I was in a life threatening accident with six other people . "I came out without a single scratch. Not one part of my body was affected , no injuries , no minor scratches or cuts . I came out like nothing happened. I can’t explain what it means to me to be sitting here completely whole and healthy after that accident . "A few things I can guarantee is that God is a miracle worker. As the car somersaulted I remember thinking to myself how is this happening to me , why is this happening BUT I also remember feeling like I was being carried, as not one part of my body felt the effects of the car tumbling. "As I pulled myself out of the car after it came to a stop from the somersaulting. I stood on the highway in complete shock asking how did I survive it . "The most interesting thing is moments before the accident I felt the spirit within me say you will give a testimony in two weeks . I didn’t understand. Moments later the accident happened. I am giving my testimony in church this Sunday ( it will be two weeks exactly to the accident) I am eternally thankful to God for what he did for me and the six other people in the car . I can’t explain the level of this miracle . There were Trailers on the road all around us , not one of them hit us as we swerved from left to right on the road .There was no other accident on account of us . I am thankful because Gods mercy said NO to what could have happened to all 7 of us in the car. "When I was a child my mummy used to make me read Pslam 121 almost everyday. The other day , it popped into my mind and I went to read It. I got chills as I realized this prayer and confession that I had said almost everyday for years was the truth in my life . “He who keeps watch over you , neither sleeps nor slumbers. The Lord watches over you— the Lord is your shade at your right hand; the sun will not harm you by day, nor the moon by night. The Lord will keep you from all harm— he will watch over your life; the Lord will watch over your coming and going both now and forevermore . ”2019 is the year of miracles . I pray God will continue to keep us and watch us . #Thankful"